Our Banana Bread bars are loaded with freeze-dried banana, walnuts, and dark chocolate. A delicious and tasty guilt-free treat! By weight, the composition of most fruit is somewhere in the neighborhood of 80-90% water. Because ingredient decisions are limited by weight, that’s not a good percentage when you’re creating a protein bar. It’s a game of grams, and you have to make each one count. That’s where the process of “freeze drying” comes to the rescue. 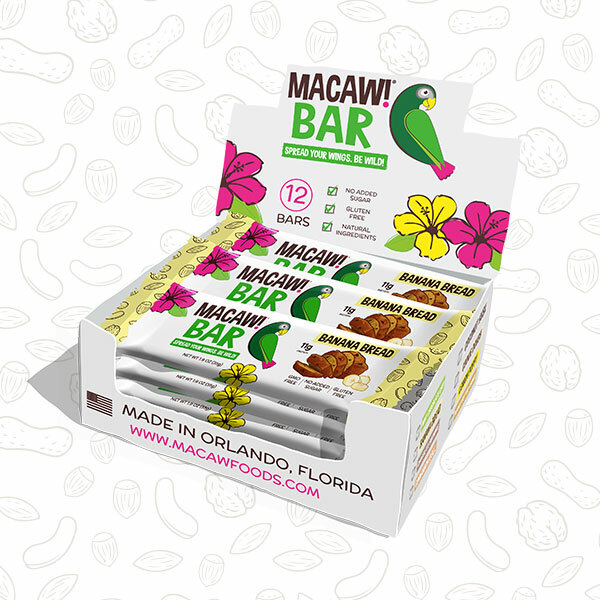 By removing every unnecessary molecule of moisture, you’re left with nothing but the two fundamental requirements for all Macaw! Bars. Great flavor, and great texture. By leveraging the most flavorful 10% of the banana, we’re able to deliver the biggest bang in exchange for your hard earned, and much appreciated, banana bucks. As a reflection of true banana bread authenticity, we’ve included bits of walnuts, organic dark chocolate, and a hint of cinnamon. The result is a unique marriage of flavor notes, typically reserved for Grandma’s kitchen. Our Banana Bread is really damn good, but don’t worry, we don’t anticipate Grandma’s becoming obsolete any time soon. 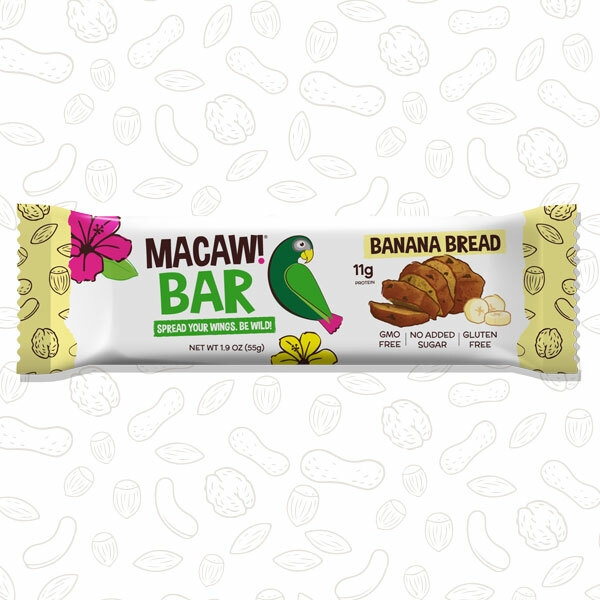 In the process of formulating Banana Bread, a wide variety of other freeze dried fruits also happened to circulate through the Macaw! Foods kitchen. I don’t want to make any promises, but I wouldn’t be surprised if another concoction from the fruit family happened to emerge at some point in the future. Let’s just say, it’s a berry exciting possibility. ORGANIC DATES: Long gone are the days of hand-pitting whole medjool dates. We now use a fresh organic date paste This saves us tons of time and ensure each batch of Macaw! Bars is an identical consistency. ORGANIC CASHEW BUTTER: Not just any cashew butter will do! To ensure optimal texture and flavor of Macaw! Bars, we use a specific variety of cashew. We recently switched from conventional to organic, with no additional price increase to you. WHEY PROTEIN ISOLATE: When it comes to whey isolate, quality is key. As with all of our ingredients, we'd never use a lower quality product that could be harmful to your health just to save a few bucks. Our whey isolate is manufactured in Minnesota, USA, and is thoroughly analyzed for heavy metals and other yucky stuff. 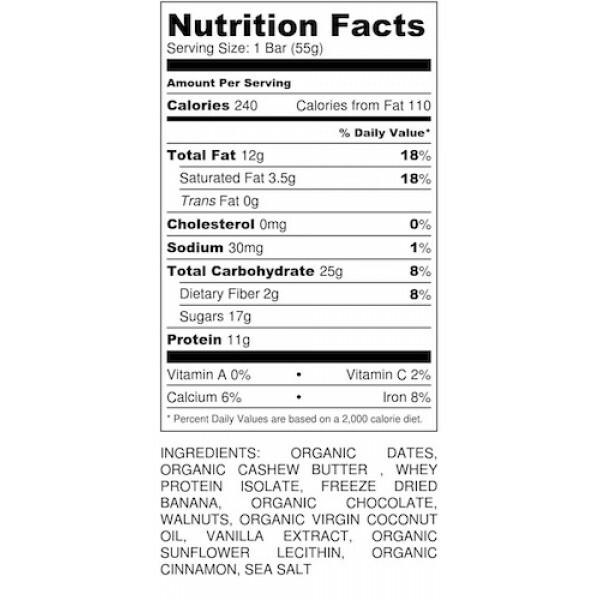 FREEZE DRIED BANANA: We don't use artificial banana 'flavor' in our bars, just REAL banana. The freeze drying process is key when it comes to unlocking the serious flavor potential banana has to offer. ORGANIC CHOCOLATE: It wouldn't be banana bread without chocolate! We use semi-sweet dairy-free dark chocolate chips, which combine beautifully with the other ingredients in this recipe. WALNUTS: A banana bread essential... what more can be said? Their crunchy texture and unique flavor really make them stand out when combined with chocolate, cinnamon, and banana. ORGANIC VIRGIN COCONUT OIL: Helps enhance the texture of the bar, while providing healthy fats that your body can break down as energy quickly and efficiently. VANILLA EXTRACT: An essential element of every Macaw! Bar flavor. ORGANIC SUNFLOWER LECITHIN: You won't taste it, but this ingredient is key to keeping the consistency of our bars top notch. ORGANIC CINNAMON: Who doesn't love a little cinnamon? Not only does it taste incredible when combined with banana and walnuts, it has significant health benefits with it's antioxidant levels at the top of the charts! SEA SALT: Just a small amount of Himalayan sea salt is all it takes to really make this recipe pop.